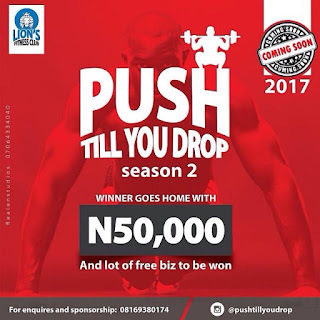 Push Till You Drop Season 2 COMING SOON!!! We bring you our 2nd edition of PUSH TILL YOU DROP 2. This is wholly a FITNESS and HEALTH event. This is a fitness /health event that combines two major competitions 1) Weight lifting Contest 2) Muscularity Contest (Mr. Avera). This is a contest to choose the strongest man. A series of heavyweight challenges would be given to all the competitors, ranging from Bench press, to push ups & Squat. The contestants who lifts the most amount of weight with the proper form across all 3 exercises would be the winner. Who would go home with 25k cash, a trophy and 6months free workout subscription at Avera Gym. Proportion: how complete the person’s physique is. Where the size of chest matches the size of their legs etc. Posing: this is in itself an art. A competitor’s ability to out pose all others and flex his muscles in an artistic form would certainly be a huge boost in making him the winner. Who wins 25K cash, a trophy, and ‎6months free workout subscription at Avera gym. We've got side attractions like : rap battle, dance, comedy, fashion grid burst, arm wrestling, skipping, taekwando display and health talk. Labels: education entertainment FUTA gist.